Loving Touch - Less Stress More Joy | Less Stress More Joy! Desde: Less Stress More Joy! 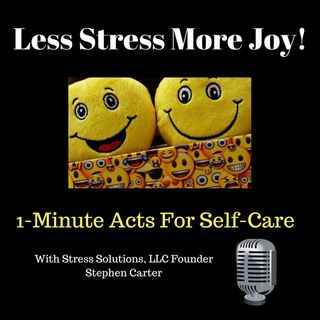 In this episode of, "Less Stress More Joy! ", you'll experience an easy to use method to calm and renew called, Loving Touch. Loving Touch uses fingertips to stroke sensitive areas of your hands. with soothing, gentle movements. You can also apply Loving Touch to your face, arms, legs as time permits to experience even deeper states of relaxation, peace, and calm. Loving Touch is a sensual, gentle way to release stress and feel great. The Loving Touch technique can also be ... Más informaciones applied to others with permission. They will enjoy a relaxing, sensual sense of calm and stress release. In addition to Loving Touch self-care, you learn how to apply the, "Yawn, Sigh, and Stretch" method to relax mind and body. This technique clears fatigue and revitalizes the prefrontal cortex of the brain after long periods of mental activities. After applying the, Yawn, Sigh, Stretch action, you'll experience a sharper sense of presence and cognitive clarity. For more stress dissolving audios and videos, visit http://MindOverStress.us.